The man who led transition efforts for President Trump at the EPA said the administration’s proposed budget signals a commitment to abolish the agency. But Myron Ebell, a Colorado College graduate and an outspoken climate change skeptic who leads energy and environment policy at the conservative Competitive Enterprise Institute, said it is not an overnight effort. The administration’s preliminary 2018 budget proposal released Thursday charts a course that could lead to the end of the federal environmental agency, Ebell said, speaking to a conservative group at the libertarian-leaning Independence Institute in Denver on Thursday. Ebell had proposed Trump make a 10 percent cut to the EPA in his first budget request. The proposal unveiled Thursday would cut the agency by significantly more, up to 31 percent. It represents about a $2.6 billion cut to the agency’s relatively small, when compared to other federal agencies, $8.2 billion budget. The cuts would result in about 3,200 employees being laid off in the initial wave, which could include many regional staff. Denver is home to Region 8 headquarters, a multi-state jurisdiction that covers much of the Intermountain West, which employs about 500 people. “I think there’s a serious commitment here to draining the swamp,” Ebell, calling upon a popular Trump campaign mantra, said to applause. The preliminary budget request would eliminate as much as a fifth of the agency’s workforce, which stands at around 15,000. More than 50 programs would be eliminated, including energy grants that help to fight air pollution. Scientific research would also face massive cuts. Environmental interests had feared Trump’s budget proposal would start to chip away at the EPA, ultimately leading to closure. News of the preliminary budget sent many into a tailspin, as it potentially signals a much faster outcome. Trump also proposed a 12 percent cut to the Interior Department and a 5.6 percent cut to the Department of Energy. “The president’s budget is a moral document, and President Trump has shown us exactly where he stands. These unprecedented cuts will hamper the ability of our park rangers, scientists, those who enforce the law against polluters, and other Coloradans from doing their important work,” said Jessica Goad, spokeswoman for Conservation Colorado. The move leaves specific uncertainty in Colorado, where the EPA has promised to cleanup toxic leaking mines that are spilling into the Animas River in Durango. The Gold King Mine spill in August 2015 was triggered by an EPA engineering error, causing about 3 million gallons of mustard yellow sludge to pour into the river. In the aftermath of the spill, the EPA declared the area a Superfund site, which allows it to spend significant resources to implement a long-term water quality cleanup effort. Some worry those efforts would be diminished by reductions at the EPA. But Ebell said a pushback to the EPA’s “regulatory rampage” does not mean that environmental controls would go away. He said regulations would still be enforced – especially on the state level – including around Superfund sites and clean drinking water. Busting up the EPA is not a good idea, Myron. 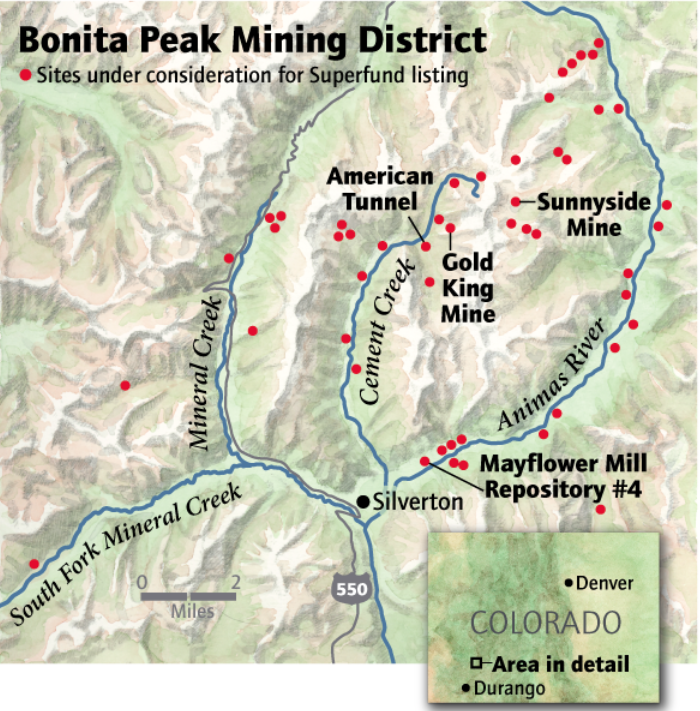 On April 7, 2016, the Environmental Protection Agency proposed adding the “Bonita Peak Mining District” to the National Priorities List, making it eligible for Superfund. Forty-eight mine portals and tailings piles are “under consideration” to be included. The Gold King Mine will almost certainly be on the final list, as will the nearby American Tunnel. The Mayflower Mill #4 tailings repository, just outside Silverton, is another likely candidate, given that it appears to be leaching large quantities of metals into the Animas River. What Superfund will entail for the area beyond that, and when the actual cleanup will begin, remains unclear. Colorado and federal authorities want to resolve the issue as soon as possible because today’s untreated flow into Animas headwaters — averaging 3,750 gallons a minute — may be hurting not only the environment but human health, officials said recently. All it would take inside this abandoned Red and Bonita Mine tunnel is a turn of the blue screw on that bulkhead plug to stop hundreds of gallons of the [acid mine drainage] from leaking. But if the EPA crew does turn that screw, shutting a valve, the blockage could cause new toxic blowouts from other mountainside tunnels, veins, faults and fissures. So, for now, the feds are letting Animas River mines drain, tolerating the massive toxic discharge that equates to more than a dozen Gold King disasters every week. “We don’t want to discount the Gold King spill, but it is good to keep it in perspective,” said EPA project chief Rebecca Thomas, who’s managing cleanup at the now-stabilized Gold King Mine and 47 other mining sites above Silverton. “Think about the millions of gallons draining each day. It’s something we should be paying attention to as a society – because of the impact on water quality,” Thomas said. The environmental damage from contaminants such as zinc and aluminum (measured at levels up to tens of thousands of parts per billion) already has been documented: fish in Animas headwaters cannot reproduce. But questions remain about harm caused by lead in water at exceptionally elevated levels up to 1,800 parts per billion, cadmium at up to 200 ppb, arsenic at up to 1,800 ppb and other heavy metals. The EPA this month intensified an investigation of possible effects on people at 15 U.S. Forest Service campgrounds, American Indians whose traditions take them to high valleys, and vehicle riders who churn dust along roads. Lead contamination at the Kittimack Tailings, a popular 8-acre course for off-road riding, has been measured at 3,800 parts per million, which is 7.6 times higher than the federal health limit. EPA scientists, collecting water and dirt samples this month, planned to interview campground hosts, all-terrain vehicle tour guides and southern Ute tribe members — assessing possible exposures. If people inhale or ingest contaminants around any of the 48 mine sites, cleanup at that site would be prioritized, EPA officials said. The federal Superfund cleanup of toxic mines across 80 square miles in southwestern Colorado is shaping up as one of the EPA’s largest mining legacy projects, contingent on Congress and agency chiefs lining up funds. EPA restoration work here is expected to set the standard for dealing with a wide western problem involving tens of thousands of toxic mines contaminating streams and rivers, for which total cleanup costs have been estimated at more than $20 billion. In the past, cleanup work at toxic mines in Colorado stalled because of technical difficulty, lack of will and scarce funds. No work has been done for years at the collapsing Nelson Tunnel above Creede, where millions of gallons of some of the West’s worst unchecked acid mine drainage contaminates headwaters of the Rio Grande River, despite a 2008 federal designation as a Superfund environmental disaster. But EPA officials are pushing for this post-Gold King cleanup including 48 Animas sites, concentrated around Bonita Peak above Silverton, because an EPA-led team in August 2015 accidentally triggered a blowout — setting off a 3 million-gallon spill that turned the river mustard-yellow in three states and sent contaminants nearly as far as the Grand Canyon. This month, EPA project leaders, bracing for winter snowfall that limits what they can do until summer, anticipated a mix of different solutions at the various sites — each unique with different conditions. They’re considering construction of water treatment plants, like the temporary plant set up to neutralize and filter drainage from the Gold King Mine. That plant has cleaned 273 million gallons of water over the past year before discharging it into Cement Creek, one of three main headwaters creeks flowing into the Animas River. Meanwhile, six surrounding toxic mines along Cement Creek drain an untreated sulfuric acid flow measured at 1,476 gallons per minute to 7,590 gallons. A water treatment plant can cost up to $100 million with annual operational costs as high as $1 million. EPA officials said they’ll combine installation of water treatment systems with bulkhead plugs to hold acid muck inside mountains. And the feds also are exploring use of “bio-treatment” systems using plants and plastic devices to filter and remove contaminants. The overall cleanup is expected to take years. “Ideally, we would come up with a way to take care of the water that did not involve a lot of very expensive, in-perpetuity water treatment,” Thomas said. There are questions dogging hydrologists and toxicologists as they embark on remediation studies.They want to know how mining tunnels, dozens of natural fissures and faults, and mineral veins are connected. “That is a big puzzle piece,” Thomas said, because subsurface links will determine whether bulkhead plugs safely can be used to contain toxic muck without raising water tables and triggering new blowouts. They want to know how much acid water is backed up in major tunnels, including the American Tunnel and the Terry Tunnel, and in the Sunnyside Mine. 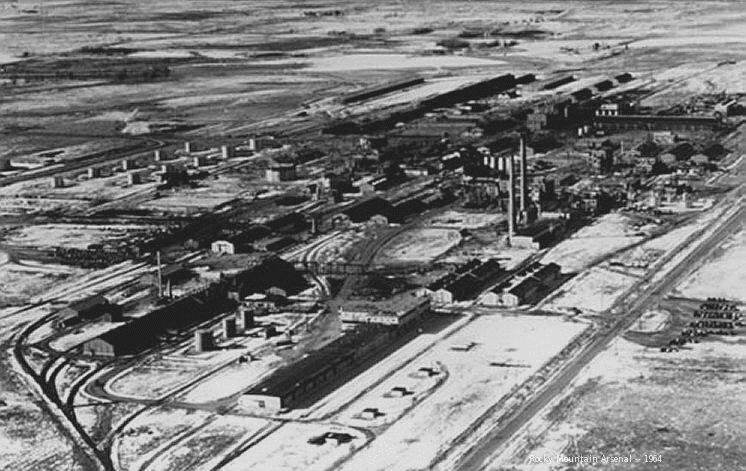 The Sunnyside was the largest mine in the area and the last to close in 1991. EPA officials said natural faults or fissures may connect acid water backed-up Sunnyside water in the American Tunnel, where bulkheads have been installed, with the Gold King Mine. Canada-based Kinross Corp., which owns Sunnyside, is considered a potentially responsible party, along with Gold King owner Todd Hennis, liable for a share of cleanup costs. And EPA officials say they are monitoring underground changes that may be affecting flows from at least 27 draining tunnels — called adits — that contribute to contamination of Animas headwaters. The state-backed installation of plugs over the past decade may have triggered the rising groundwater levels that documents show the EPA and state agencies have known about for years. For example, orange sludge oozed from a grate at the Natalie Occidental Mine — one of the worst sources of untreated mine waste — north of the Silverton Mountain ski area. EPA on-scene coordinator Joyel Dhieux inspected it this month, hiking beneath snow-dusted mountain peaks. The backed-up sludge obscured a culvert installed years ago by state mining regulators. A huge tailings heap, leaching contaminants into a creek, suggested significant underground tunnels. And then there’s the problem inside that Red and Bonita Mine tunnel where a bulkhead plug is installed but not closed. Dhieux and her crew determined the plug, installed in 2015, 15 feet thick and framed in steel, appears solid. If the EPA closes the bulkhead, she and other EPA officials said, it will be done very slowly. They’re considering a partial closure, as a test, next summer. The plan is for dozens of researchers to fan out across green mountain valleys, while contractors inside the tunnel turn the screw, watching for sudden orange spurts. Federal and state officials have agreed in principle to a $6 million settlement with a mining company to recover cleanup costs at the Superfund site just north of town. A proposed consent decree with Denverbased CoCa Mines was filed in U.S. District Court in Denver Thursday. The proposal would still be subject to a 30-day public comment period and the approval of the court. Through last June, the U.S. Environmental Protection Agency had spent $10 million on the Nelson Tunnel/Commodore Waste Rock Pile Superfund site. More than half of that money went toward the stabilization of the waste rock pile and the reinforcement of the West Willow Creek channel that runs along side it during an emergency response in 2008 and 2009. In a complaint filed the same day as the proposed consent decree, EPA alleged that a company operating under a joint venture partnership with CoCa had sent 500 tons of mine waste onto the waste rock pile and contributed to its destabilization. The complaint also alleged that CoCa inherited liability for the site when it bought out its former partner in 1989 and thereafter failed to conduct cleanup. CoCa Mines owned and operated in an area that’s now part of the Superfund site from 1973 to 1993. Cleanup work at the Superfund site has come to a halt while EPA conducts a feasibility study on potential remedies for the Nelson Tunnel, which is responsible for the majority of the contaminants in West Willow Creek. One potential option would involve the dewatering of the collapsed tunnel, although it would be dependent upon the initiation of mining by Rio Grande Silver at the nearby Bulldog Mine. The tunnel, completed in 1902, was used to drain and ventilate mines along the Amethyst vein, while also providing a route to haul ore out of the mines. The Environmental Protection Agency has sued a mining company operating in Mineral County in federal court to recoup hazardous waste cleanup costs. The U.S. sued Coca Mines Inc. for cleanup of hazardous substances in the Nelson Tunnel and the Commodore Waste Rock Pile Superfund Site. The superfund site is in the San Juan Mountains less than 2 miles from the town of Creede. Shafts were dug in a series of hard-rock silver mines operated between 1889 and the 1980s tapping the “Amethyst Vein.” Horizontal tunnels also were bored, including the Nelson Tunnel. The Nelson Tunnel is partially collapsed but continues to drain acid runoff. The Commodore Waste Rock Pile, just outside the entrance of the Nelson Tunnel, included a water conveyance system that failed around 1995, releasing mine waste containing heavy metals including arsenic, cadmium, lead, manganese and zinc into West Willow Creek. The creek flows into the Rio Grande River 4 miles below the site. In 2008 and 2009, the EPA conducted waste removal studies at the waste pile site. The EPA is now in the process of completing a feasibility study of remedial actions for the site. Through June 30, 2015, the EPA incurred nearly $10 million in costs. Some of those costs were covered by the Asarco Environmental Trust. The lawsuit says the discharge each day from the Nelson Tunnel into Willow Creek carries 375 pounds of zinc, 1.37 pounds of cadmium and 6.39 pounds of lead. Zinc levels have hit 25,000 parts per billion, hurting fish reproduction for more than 4 miles down to a confluence with the main stem of the Rio Grande, where dilution eases the impact. Rio Grande Valley near Creede. It was a long, difficult road as the community of Leadville went through a more-than-20-year process through the Environmental Protection Agency’s hazardous cleanup Superfund program. But local government officials here on Thursday told a large constituency of Southwest Coloradoans that, ultimately, it was worth it. Various agencies from the Animas River watershed are on a three-day tour of several Superfund sites in Colorado, hoping to gain knowledge on the process as stakeholders look to make a decision about long-term water treatment in the Animas basin. But after more than a century of unregulated mining in Leadville, a two-hour drive west of Denver, an adit suffered a blowout, causing a die-off along the Arkansas River down to Pueblo. In 1983, Leadville was placed on the EPA’s Superfund list, just a few years after the program was signed into law by President Jimmy Carter. It wasn’t until 2007 that the town was officially taken off the National Priorities List. After the many battles between local, state and federal agencies, local officials there said it left a bittersweet feeling throughout the community. Melissa Sheets, a reclamation project manager with the Colorado Department of Public Health and Environment, said this week’s tour, which includes a number of stakeholders, is a sign the agencies have learned from past mistakes in dealing with local communities. After visiting Leadville, the group went to Minturn’s Eagle Mine Superfund site, where residents said there really was no other option beside Superfund. “There’s always some tension and disagreement as to what cleanup measures are going to be most effective,” said Bob Weaver of Leonard Rich Engineering. “But it’s really important to realize everybody wants to achieve the same goal. You’re not always going to agree, but it’s a lot better than doing nothing. Representatives from the Animas River were sure to point out the many differences between Leadville and Minturn, ranging from potentially responsible parties to differences in geology. But San Juan County Commissioner Ernie Kuhlman said overall it’s been a productive trip. Leadville Mayor Jaime Stuever offered one last bit of advice for the group before a tour of the California Gulch Superfund site. The Creede Mining District had many waste rock piles, seeps, mine adits and mill tailings when the United States Environmental Protection Agency (USEPA) and the Colorado Department of Health and Environment (CDPHE) performed their preliminary assessment of Willow Creek in 1994. The findings prompted further inspection of Willow Creek’s water and were summarized into a report in 1997. This report provided the basis for listing the Creede Mining District on the National Priorities List under the federal Comprehensive Environmental Response, Com-pensation and Liability Act (CERCLA), commonly known as the Superfund Act. The Superfund Listing encompassed the entire Creede Mining District, including both branches of Willow Creek. The consequences of Superfund designation on Creede’s tourist based economy were unknown, but a few concerned citizens were not interested in finding out. Steve Russell from the USDA Natural Resources Conservation Service (NRCS) and Mark Haugen of the Rio Grande Soil Conservation Service and with the support of the City of Creede, held a meeting and informed attendees about the proposed listing. A year later, the Willow Creek Reclamation Committee was taking action to address the issues causing poor water quality in Willow Creek without EPA intervention. 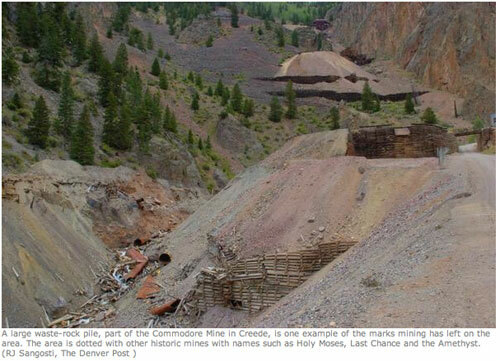 The Creede Mining District was not listed as a Superfund Site and the Willow Creek Reclamation Committee went to work. To complete their work, the WCRC defined six core goals to guide their efforts: 1) Protect the Rio Grande from future fish kills associated with nonpoint source releases during unusual hydrologic events. 2) Improve the visual and aesthetic aspects of the Willow Creek watershed and its historical mining district. 3) Implement appropriate and cost-effective flood control and stabilization measures for nonpoint sources. 4) Protect and preserve historic structures. 5) Reclaim the Willow Creek floodplain below Creede to improve the physical, chemical, biological and aesthetic qualities of the creek as an integral part of the local community. 6) Continue to improve water quality and physical habitat quality in the Willow Creek watershed as part of a long-term watershed management program. From its inception, the Willow Creek Project has had a firm commitment to find innovative, non-regulatory approaches to improve the water quality in Willow Creek and to protect the gold medal fishery in the Rio Grande River downstream – a premier fly-fishing stream. Local residents were ready and eager to apply best management practices (BMP’s) to reduce the metals in the stream so that water quality standards could be achieved, only to find out that the information and data on the sources and loadings of the metals were incomplete. The WCRC received CDPHE funding and spent from 1999-2003 sampling surface water, groundwater, waste rock piles, mine pools, macroinvertebrates and fish to fill in the information gaps. Want to have cancer-causing, bird-killing DDT sprayed in your neighborhood? How about having high levels of brain- damaging mercury dumped into your favorite fishing spot? What about paper mill wastes clogging up rivers and fouling the air people breathe? These health hazards were once commonplace in communities throughout our country. That they are no longer the hazards they once were is due in no small part to the Environmental Protection Agency, which protects us from these and other environmental abuses. Without EPA oversight, the United States would be a much less healthy place to live. Those who believe we do not need federal regulation of activities that can turn the country into a toxic waste dump are likely unaware of the far-reaching environmental and human health consequences of such actions. They may also not want to accept the fact that some individuals and many corporations will put profit ahead of all other considerations–including the health and well-being of the general populace. More Environmental Protection Agency coverage here.